Feiwel and Friends, New York, 2015. 222 pages. 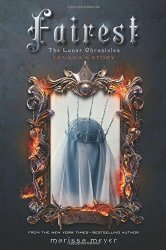 Fairest is a short prequel to the other books in The Lunar Chronicles, filling in the back story of Levana, the Queen of Luna. All the books in The Lunar Chronicles parallel fairy tales, and as the title indicates, Levana takes the place of the wicked queen in Snow White. In Fairest we learn how Levana acquires a stepdaughter, named Winter. This is not a nice story, and Levana is not a nice person. But readers understand her better after reading this book. She wants to be a good queen for her people. She was cruelly disfigured as a child, which is why her glamour is so important to her. And she made an attempt at love, but the power she had to manipulate minds short-circuited that quest. People think she's controlling? Well, she takes ruling more seriously than her sister did. It's all for the good of Luna. She will do whatever is needed for her people. At the end of the book there is a preview for Winter, the final book in the series, coming out in Fall 2015. We don't have long to wait!